Living where we do, a long portion of the year our yard is covered in snow. Still, we haven’t taken advantage of it as we should. 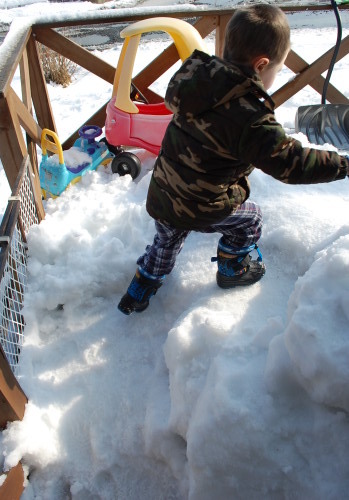 Between Max’s (now mostly overcome) snow phobia, our thin Texas-adjusted skin, and the related lack of heavy snow gear, we’ve spent most of the winter boggling out the window as massive piles of snow accumulated before our very eyes. On Tuesday, I decided that that wouldn’t do at all. With the help of a snow shovel and twenty minutes of hard labor, I was able to clear the snow away from the door enough for us to get out onto the porch. Of course, once you get started…you remember why you thought it was fun as a kid. We packed and filled a nice little platform and carved some stairs back down. It turns out we have a Big Wheel under all that snow! I completely forgot it was there. Oh well, it will just have to lie entombed until the snow melts. Then I noticed some water running down from the middle of a gutter – it was warmish that day, so all the snow left on the roof was melting – and went to go see whether it was leaking. (It’s not. Just sagging.) Of course, once I got off the porch Charlie made a break for it, too. I coaxed Max down into the deeper snow, and he forgot to be worried about the fact that it was ‘touching him’ as soon as we started making this. He’s, um – got character. It’s not so bad once you think about the fact that I made this with my boots and a shovel (I didn’t have my gloves on). Max doesn’t care, though. He’s just so happy that we have our very own snowman at last and he helped to make him! We had to go in shortly afterward, because Charlie went and soaked his top half in the freezing water coming down from the gutter, and his bottom half in the puddle it made. We went shopping out in town yesterday – not something we often do (leaving aside restaurants and the Daiso). Now there are lots of things that it makes more sense to buy on base. Gas, for instance, is about 1/2 to 1/3 of the price on base that it is off base. Shoes are another thing I buy in the BX, for the simple reason that my feet are much larger than any shoes I’ve yet found out in town. When it comes to produce, though, off-base is the way to go. While there’s more than one reason for that, the biggest is that all fruit sold at our commissary comes either from the States or the farms in this area. Any fruit from local farms is sent to the regional processing and distribution center…500 miles away…before being sent back to our store. This renders it both older and more expensive. Now, I usually buy most of our fruits and vegetables at the commissary (frozen produce! convenient and affordable; also non-local items like bananas and oranges are comparable) but occasionally I’ll take a trip to the Yokomachi or the Universe when we want something fresher. 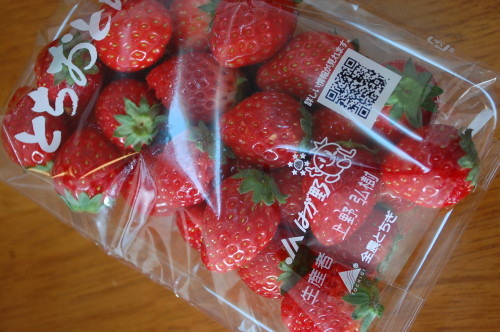 So, this week, Japanese strawberries began appearing in the commissary, about $6 for six or seven large (pale) strawberries. Since strawberries are, I think, Max’s favorite thing on earth, I decided to duck over to the Yokomachi on the off-chance that they had some there for less. Aren’t they gorgeous? 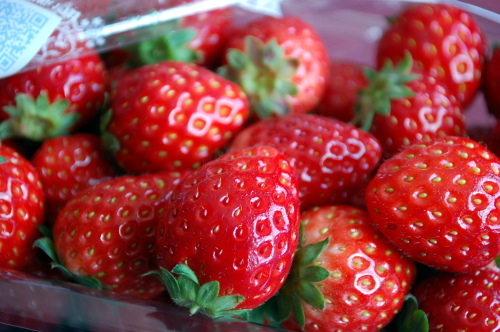 Seriously, I’ve never seen such gorgeous ripe strawberries in a grocery store – especially out of season. These are not the giant faded pink ones left when the stand has been picked over; they’re smaller, sweeter, and perfectly red. (For the record, I did not see any sad white or rotting strawberries in their strawberry display. Not even the giant ones, which they also had there. Seriously. Once I realized I didn’t see any, I looked.) They only cost about 300 yen. So to sum up: many more strawberries, much nicer, half the price. Gorgeous. We’ll be heading back once Max polishes these off. So, perhaps tomorrow! 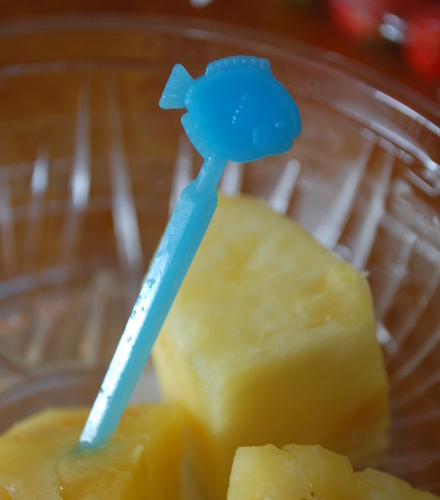 Any time we stop at the Yokomachi I pick up one other thing, (Well, aside from the Tim Tams. They’re the only store in town that carries them.) a bowl of fresh pineapple. Since whole pineapples run in the range of $7 apiece, I’m more than happy to pay 300 yen for a good-sized bowl of fresh pineapple chunks. Oh what a perfect post–snow and strawberries! Your snowman certainly DOES have character and the kids love it, which is what’s important. 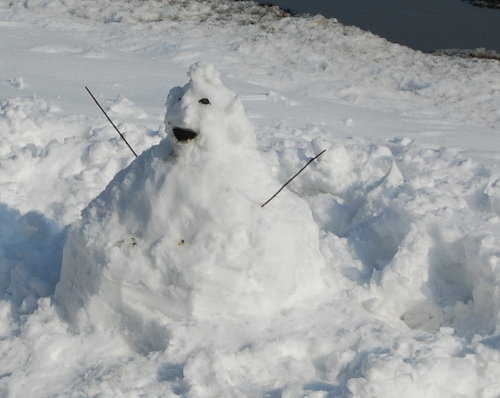 I think I only remember making a snowman once. 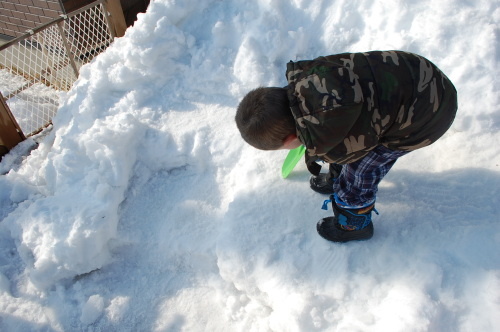 We had a big hill in our backyard and I think we started at the top of the hill with a little ball of snow and tried to roll the ball down the hill — like in the cartoons. Not so effortless. I think I made it with my two sisters. Nice memory! Mmmm, strawberries, I’m so jealous! I love playing in the snow. We had so much snow here in Southern Alberta, that we got these huge drifts in our driveway and got snowed in. My cousin came with his bobcat and dug us out. The girls were excited because now we have a snow mountain in our front yard! Your snowman looks wicked awesome by the way.